Lee, male, was 53 years old when he was diagnosed with cancer of the kidney in March 1997. A CTscan showed a well defined solid mass in the right kidney. This could be an adenoma or a low grade carcinoma. Lee underwent an immediate surgery to remove his right kidney. The pathology report dated 14 March 1997 stated: Specimen of kidney: 225 gm, measuring about 11 cm x 5 cm x 4 cm. Yellowish tumour with fibrous areas seen in the middle of the kidney. The tumour measures about 4 cm in diameter. Interpretation: right kidney consistent with clear cell adenocarcinoma. After the surgery, the surgeon did not consider mop-up treatment like radiotherapy or chemotherapy necessary. There was no medication to take either. Lee came to know us through our book: Cancer Yet They Live, which was given to him by a friend. Since then he has been on our therapy. On 31 August 2006, we had a three-hour long conversation with Lee. Lee: My operation was in March 1997. So by March 2007, it would be ten years after my cancer diagnosis. I am doing fine. Q: So for the past nine years, you have been taking the herbs and taking care of your diet? A: Yes, I had been taking your herbs very seriously since my operation and I took care of my diet as you recommended. Q: Now that you have lived for more than nine years after your cancer diagnosis – did you ever feel that cancer has been a threat to you? A: No. I didn’t think that cancer is the only threat to my life. Everyday we all face many threats to our life. So cancer is just one of these things. In this world you face threats when you step out of the house. Even in the house, there are dangers. The idea that just because someone has cancer, he is more vulnerable than others is not right. I may die of other causes. Q: So, during the nine years, was there a time when you felt you could not make it? A: No, there was no such feeling. This is because the body does not show any sign of problems at all. I always look at the positive side of things and I do not pay much attention to the negative. I accept cancer as part of my life. Q: When you look back at your cancer experience, what do you think are the factors or things that had contributed to your well-being today? A: Firstly, it was the people around me who directly and indirectly gave me their love and touch. By their actions they expressed their desire that I get well and this made me feel much wanted. Let me give you some examples. There was this lady who came to the hospital with a bagful of money. She placed it on my bed and said: Brother, this is seven thousand ringgit for you. If this amount is not enough, mama said please let us know. This person is not related to me. She was just a friend – a former Hainanese neighbour, belonging to the same clan as I am. I never asked anybody for any help. She came and she did not even ask me if I needed any financial help. She just deposited the money on my bed. Her action showed me that people wanted me to get well. Therefore to me, I must get well because they wanted me to get well. This incidence created a strong feeling within me that I must get well for their sake. I felt so wanted. If I was left unwanted, there was no need for me to live anymore. I might as well die. People showed their concern and love in different ways. There was a three-year-old boy. My wife used to take care of him when he was a baby. He came and held my hand while I was lying immobilised in bed. I called out to him: Ah Boy, Ah Boy. He responded: Uncle, no need to say anything and he cried. By doing this he showed me that I was wanted. There must be a purpose for me to live on. As I have said earlier, life has a purpose and by what these people had demonstrated, I should not die yet. Another contribution was a lady friend who gave me your book. At that time I did not know anything about cancer or about you. She personally gave me your book for she wanted me to get well. She told me: This is something which can help you, read this book and then call Dr. Chris. I felt the love and concern she had for me. Again, I felt wanted. That book was the one with a simple white cover (note: our earliest version of Cancer Yet They Live). I did not judge the book by its cover. I read it over and over again. What the book pointed out – or what you pointed out – was very true. The junk food and the negative emotions did not take care of my body. What you wrote made a lot of sense. All along in my life in the navy, I had been eating plenty of meat – meat for breakfast, meat for lunch and meat for dinner. I ate very little vegetables and even that was over cooked. I drank a lot of hard liquor. That book made a lot of sense and I could relate it with my lifestyle. It was there for me to see and compare. That book made me realise that I had been abusing my body all those years. After I found out the mistakes of my earlier lifestyle, I started to do the right thing. The information in your book woke me up and showed me where I went wrong. Knowing my mistakes, I started to make the necessary changes and corrections. The only way for me to carry on was to stop abusing my body. Without your book, I would not have known where I had gone wrong. When I wrote you, you asked for my medical reports and later prescribed Capsule A and Mt.Guava deTox tea. Q: After reading the book, did you need to be “pushed” to do something or did you, on your own, willingly decided to practise what I said? A: I decided willingly to put into practice what you wrote without any push from anybody. There were friends who told me that without chemotherapy, the cancer would spread, etc., etc. But I ignored such comments. My doctor did not give me any medication. I told him that I was taking your herbs. He did not object and said: Whatever you do, you must come back for a check-up. Initially I went back for a check- up every six months and later once a year. This routine lasted for six years – doing the X-ray and scanning. I stopped going for the check- up after the seventh year although I still continue with the blood test. Q: After you read the book, did the knowledge you got from it help you very much? A: The contribution arising from the knowledge obtained from the book has lasted even to this day. It has not stopped. That book was the one that started to move me forward and made me want to understand more about cancer. It has changed my destiny and the outcome of my cancer journey. When I read the book, I began to fathom what the authors wanted me to know and understand. Of course, if you just skim through the pages, you learn nothing. The book has changed my life. Even today I still read it – I have done it a thousand and one times! Q: When you took the herbs, did you believe they were going to work? A: Yes, my hair became black and I felt better just after one week. Even before I took the herbs, I had believed what you wrote. Q: What would you say about your doctor? A: I was very lucky to have a kind and understanding doctor who operated on me. He not only did his job well but also was wiser than just being a doctor who operated on patients. He went further to arrange for me to be operated earlier, on the day which was not his scheduled operation day. He was prompted to do so because I had already done a biopsy and the kidney had been poked. To him it was best that the kidney be removed as quickly as possible. This caring attitude made me feel really good. My doctor did not want me to go for chemotherapy. If he had asked me to undergo chemotherapy, I would have done that too. In his wisdom he did not see the need for chemotherapy. All the above are things that have contributed to what I am today. Q: Now that you are doing very well and are very confident, does it occur to you that one day the cancer may come back – have you given this any thought? A: Yes, you use the word confident. I don’t want to use that word at all. Life is uncertain. If we understand that cancer has no permanent cure, you can accept that you may be able to live for two, three, ten or twenty years and then cancer comes back again. So, that is expected. Q: What if the cancer comes back? A: When it comes back, I will look at it again and find out why it comes back. Maybe at that time, my body is on the downward turn due to old age. Because of that, cancer takes advantage of the situation. So, we cannot blame anything or anybody. It is a natural process of life that the body shuts down. It is just like my old Opel car. I sent it to my mechanic and he told me: Uncle, the car is “lok” (beyond repair) already and cannot be repaired anymore. I had to accept it and write it off. Life is like that and is full of uncertainty. So in life, I cannot use the word confident. If I am too certain about things, I may end up disappointed. If you don’t hope for something, there will be no disappointment. 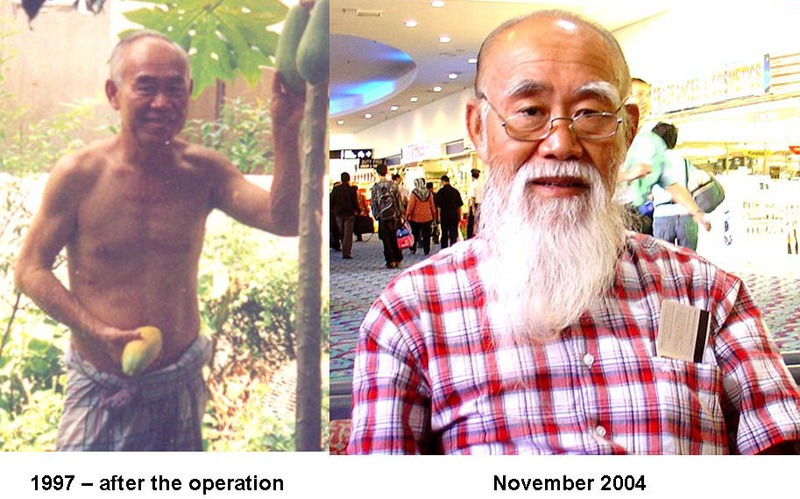 As of this writing, September 2011, Lee has been doing well – 15 years now!